The Short Films Blog: "DAS RAD"
The primitive beats of a bongo and the Spanish thrum of a guitar bridges a black screen and its opening credits with an establishing shot that dollies right to reveal a mountain peak and the valley it overlooks. 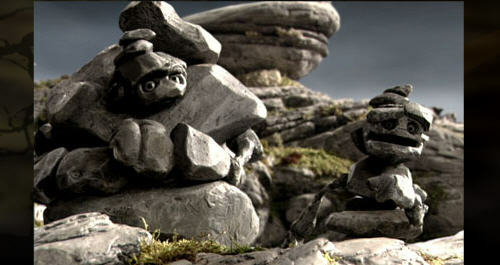 This non-diegetic music stops with the first words of dialogue, which come from a pile of rocks named Yule. He addresses the pile of rocks to his right. “Look at this, Kew. I think there’s another one back there,” he says, pointing at some new growth on his back. Kew, absent-minded, swings his pile over to Yule and begins to peel lichen from the dorsal side of Yule’s shoulder when his attention shifts to growing activity in the valley. The pair sits next to a dead tree that has cast its branches like tentacles or the spines of an umbrella over the two of them. The tree remains static while everything else seems involved in a frenzy of change: clouds rush across the sky with an insistence that turns the ubiquitous color of sky from blue to mottled gray; pine trees make split-second progress from seedling to full-grown specimen; lichen and moss scuttle across the landscape and Yule’s broad abdominal section as if working against a deadline to carpet the whole mountain before the end of the world. It becomes apparent, however, that the film takes place closer to the beginning of the world or, rather, of human history. By the time Kew notices activity in the valley and asks, “What are they up to down there?” it is clear that he refers to a village in its infant and primitive stages. A much closer shot of the valley depicts simple A-frame wooden houses that jump like the pine trees into immediate existence, confirming the sensation that all this activity is frenetic because time itself is in fast-forward. How fast one is not sure, but fast enough to reveal a world in which anything that does not have the longevity of a tree or a rock or a wooden A-frame, or the patience to stand very still for a long time, will make no appearance. Just as, in fact, rock people move too slowly to exist on a human plane, humans move much too quickly to register with the rocks. But the film makes clear the fact that despite appearances both these worlds very much exist, and at that not independently one of another. After Kew makes his discovery of the valley’s activity, the timing of the world slows to normal and reveals a blue sky and a Neanderthal man in the background taking whacks with a primitive axe at a pine tree. The thump of stone against trunk provides the soundtrack for another man’s discovery, in the foreground, of Kew, now a static pile of rocks, and the enigma of a free-standing stone that, in fast-forward, Kew was busy spinning for fun. Kew has put into abstract terms and a celebratory tone the philosophy of modern progress and the achievements of industrial society, which we now celebrate. But development as an end in itself soon, in terms of rock-time, proves disastrous for the earth. As the rate of development increases the spread of human lichen becomes almost tangible, like fog. Once pavement replaces the dirt path vehicular traffic becomes so persistent that it hovers in blurred view to the left of Yule and Kew. The messages on a billboard flash like a high-speed music-video montage, and the once-wooden village mutates into a metropolis of rising skyscrapers that rush across the valley and up toward Yule and Kew, now shocked and unprotected near the spot where the ancient tree was uprooted to make way for an elevated highway. The rush of high-rise construction, set to the accompaniment of those same opening primitive bongo beats, all allegro, rolls toward the mountain under a darkening sky—a visual trope for the threat that development poses the earth. The medium of this film is key to the success of its message: to depict the end of the world in a fantastical and humorous form like animation, in addition to making the depiction more feasible, is to sweeten the polarizing subject matter just enough to make it palatable to a wide audience. This film presents a magical world for those of us who come and go so quickly (the impermanent human), but not a fictional one. It is our world in high speed, and this Claymation depiction of it reveals at once our own meaningless temporality and the hefty impact of human life in aggregate upon the earth, that big, round, living rock. Even the anthropomorphized rock piles, as fantastical as they of course are, represent a perspective consistent with a world familiar and real: Kew and Yule represent the earth’s perspective. And humans, they’re like lichen, that annoying and unsympathetic growth that spreads across the broad abdomen of the earth as if working against a deadline to carpet the whole landscape before the end of the world. This exchange between Yule (“That was lucky”) and Kew (“your head is covered in moss”) contains the paradox of the film. Yule’s statement expresses the earth’s vulnerability, while Kew’s expresses its relative indifference in the grand scheme of its life cycle to human presence. These views are not mutually exclusive, but they are conflicting, and they seem to represent a political conflict extant in human society today. Some believe that the world is too big for humans to have any lasting effect, and others believe the earth to be a living organism as sensitive to human exponential growth and industrial action as any one of its constitutive parts. Some see the earth as impervious rock; others as a softer constituent, like clay. The literal translation of the title of this student film, “Das Rad,” is “The Wheel.” The official U.S. title, “Rocks,” is appropriate for several reasons. It cooperates with the medium of the film and also invokes the protagonists and the perspective they represent. It misses, however, a major theme that “The Wheel” captures, namely the consequences of an industrial and technological trajectory that justifies development for its own sake alone. The wheel, that symbolic celebrity (along with fire) of human advancement, expresses that theme and the spin of the earth that enacts a cycle so nascent to life and sometimes so anesthetized, at least in modern society, as to fade into obscurity behind the blurry ribbon of cars on a road. This film attests to the power and achievement of the short film! It is a technical marvel to watch, but also, like Rhead said, the message is both clear and thought provoking. The round stone, symbolizing the circle of life, is rolled over and over again and then later compared to the wooden stone, which of course, disintegrates rather quickly. This commentary on fragileness of wood versus the permanence of stone also speaks to the human condition. Simply, it reminds me of the saying, "things aren't meant to last anymore." The wooden wheel appears to be better than the rock’s rolling stone, but it breaks on the road then crumbles in the Kew’s hand. Similarly, the city grows exponentially, then is gone in an instant. In a larger sense, the circle imagery clearly speaks of the human population's certain demise. Like the dinosaurs, we will some day be fossils and only a blip of a memory to the Earth. This film is so sharp on every level-the animation, the premesis, the questions it leaves us with. This animation allows us to see the natural world observing and commenting on our world...in a fresh way. We are constantly aware that because this is animated, it's fantasy and yet, the convincing images and truths they convey make everything seem alive,true and powerful. The change in speed throughout the film reminds us that their is always a tenuous relainship between humans, earth and time. Neat film.